The Two Gay Geeks went on holiday for two weeks in early December. Our time included a visit to Walt Disney World with Keith’s favorite sister, Lynn and her husband, John. We also went on a Disney Cruise aboard the Disney Magic for a Very Merry Time cruise to Cozumel. If you haven’t noticed Ben and Keith are huge Disney Fan(atic)s so, this trip was all about Disney and if you also don’t know, Walt Disney World and Disney Cruise Line have an over abundance of food options, with some being quite good. I plan to write several reviews of dining options at Walt Disney World and Disney Cruise Line and I will start with dinner on our last night in Orlando at California Grill perched atop the Contemporary Resort Hotel at Walt Disney World. Walt Disney World has offered various dining packages for close to 20 years, although it has seen many changes over the years, they are still a great option if you want to go on holiday and not have to worry about taking a bag o’ cash just for food. If we are staying more than a few nights we usually get the package that offers three full service meals in a day, this also includes snacks. Most of the sit down restaurants are one full service credit for a meal (includes an appetizer, entrée, dessert, and a beverage. 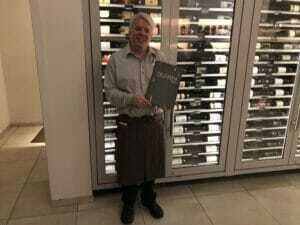 They have recently started including an alcoholic beverage in some locations.) but , there are a number (California Grill being one) that require two credits for dining. This usually works out for us, as we like to mix it up and have several really nice meals and some economical meals. The snacks we usually use to fill in other times since two meals a day is usually sufficient with the amount of food they serve. 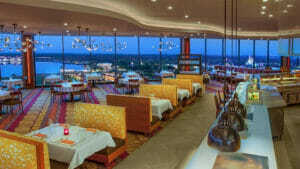 California Grill is an upscale restaurant at the top of the Contemporary resort and requires a reservation as well as has a specific dress code. Nothing like Victoria and Albert’s at the Grand Floridian, which requires a jacket and tie. You check in for your reservation on the second level of the hotel and then they show you to a specific elevator and take you up (it is an express with an attendant). As you exit there is a very nice waiting area and a lounge off to the side of this area. 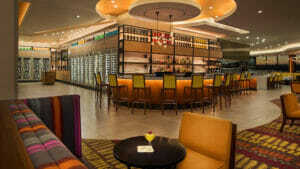 The décor is modern and very efficient for a restaurant. We were shown to an auxiliary dining room by the wine storage area (which is immense). We did not have a view of the park from our table and it was a little more intimate than the regular dining area which was good. This being our last night we were about peopled out… and wanted to enjoy a nice meal without a lot of hubbub. We were presented with menus and Ryan came by almost immediately to take a drink order. 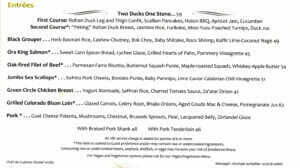 I have included the menu’s below. The menu is so large I had to split it into two sections so I could scan it. 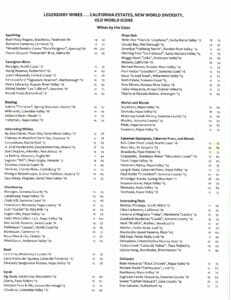 I also scanned the wine menu for you to see the selection. We all ordered iced tea and started to peruse the menu while Ryan went to get our drinks. 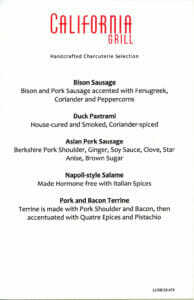 As you can see there is quite a selection of appetizers and entrée’s including my favorite appetizer of cheese and charcuterie. Since they were separate items, I had to order both (of course) and I was prepared to pay additional in order to experience the full spectrum of cheeses and meats. Ryan was very accommodating and at the end when it came time to settle the bill, he was able to work some magic (with the managers approval) and use another dining credit for the additional food. Otherwise we would have lost a couple of credits. 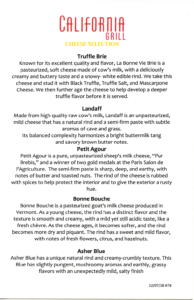 See the itemized menus for each of the meats and cheeses below. For my regular meal I ordered the California Combination Roll as the appetizer (I forgot to take a photo…). It was quite large and was shared among the table. The roll was well packed with nice chunks of crab and jumbo tempura shrimp. I like California Rolls, what can I say, they are a great combination of tastes with wasabi and soy sauce. For my entrée I selected the Grilled Colorado Bison Loin that was cooked to medium rare and plated with Bhajia Onions (with a light tempura batter), celery root, a glazed carrot, and to make it even better aged Gouda mac and cheese. The beef was almost fork tender with a nice beef flavor with that certain extra something that says Bison. The celery root and carrot complimented the beef and the onion rings were especially nice. The mac and cheese, Oh My Gosh, this was a delight, the flavor was a nice creamy Gouda flavor and it wasn’t baked to death and sprinkled with the right amount of bread crumbs on top to round it out. Ben ordered one of the pizzas for his appetizer (of course, this is Ben and it is pizza). I just have to say that most of the appetizers are the size of entrée’s so, we had way more food than we could possibly eat. He ordered the Pork Tenderloin for his entrée, which was wonderfully prepared. John ordered the Chicken and Lynn ordered the Bison (well done, I nearly cried but that is what she likes). Everyone had plenty to eat. Just a bit after we received our appetizers Ryan came by to inform us that he fireworks show would begin in a few minutes. We were shown to a walkway outside that provided a spectacular view of the Magic Kingdom Park and the fireworks. That was the icing on the cake for this trip. This being our last night having wonderful food with family and a fireworks show to boot. As we got back to the table it wasn’t long until our meals arrived and then we needed to choose dessert (really! ), as I recall it was boxed up and went back to our hotel. We chatted with Ryan (of course we would, that is what we do) about how long he had been with Disney, he indicated it was a long time. There were several tables in this room filled with some of his “regulars”. We also asked about the staff and it turns out the sous chef, Nikk, working that evening started his career at California Grill as a line cook and went to school and is now back. It was a great evening and we closed the place down, as was our custom for this trip. If you want to do it up right when you go to Walt Disney World, you can’t go wrong with California Grill but, be sure you stay on top of the time to make reservations as they go fast for this establishment. We let our wonderful friend and travel agent, Teresa Cory of Fairy Godmother Travel (see our ad for Fairy Godmother Travel in a side widget) take care of that for us and we got the best dining time and fireworks. It was a wonderful to a great vacation. 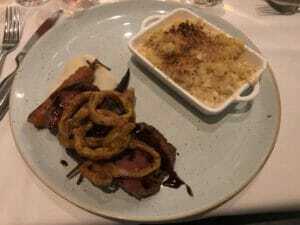 Next in Restaurant reviews from Walt Disney World and Disney Cruise Line are (in no particular order) Jiko – The Cooking Place, The Hollywood Brown Derby, Palo, and Dining Rooms of The Disney Magic. Being Keith’s “favorite” (and only) sister I have to add that the fireworks show from Magic Kingdom on the balcony of the California Grill was fantastic. The huge balcony provided a perfect overlook for the show on a grand scale. Not only were we treated to the entire view of the park but the sounds, music, and magic that went along with the display as well. And, our food wasn’t sitting at the table getting cold because the kitchen staff plans their service around the fireworks and no food is delivered during the show. My additional critique would have to do with the size of the appetizers. I too, like Ben, ordered pizza as my appetizer. Knowing that we would soon be served a main entree fit for a Gaston-type appetite I was certain the pizza would be a cute little two-bite morsel on a dainty plate. Imagine our eyes when, along with the other over abundant appetizers, we were served pizzas that would serve two people an entire meal at just about any pizza kitchen you would visit! The food was excellent and the service we received from Ryan was a real joy. No wonder the dining room in which we were seated was filled with people who “knew” him, visited with him, and gave him hugs as they left…He made us feel like family! 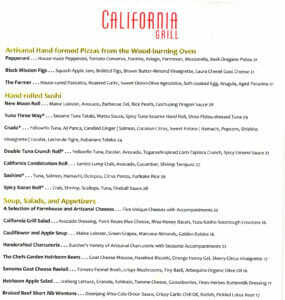 California Grill is a definite “yes”, especially on the Deluxe Dining Plan where the cost is not a concern.